It’s happened again. And it will happen again. Thailand was sold a pup and it now has egg on its face but nobody is going to take the blame. The British millionaire James McCormick, 56, who marketed the fake human powered bomb detecting device the ADE651, has been found guilty at the Old Bailey of three cases of fraud. McCormick made £50 million selling a novelty golf ball finding machine worth less than US$20 to military forces as bomb detectors – in fact all purposes detectors. At first he simply attached stickers bearing the words ‘International Association of Bomb Technicians’ to the golf ball finders to make them look authentic. His ‘improved’ version the ADE751 could even detect drugs, it was claimed. He sold them to the Thai Border Patrol Police with card inserted which could allegedly detect heroin. The whole world has known these machines were a total con for years. They come under different names, for instance the GT200 – very popular in Thailand, and the Alpha 6, also sold here. But it has taken a court in Britain to finally judge the lie. So why have these alleged bomb detecting machines been selling so well in Third World countries – if I can still call Thailand Third World? The answer is under counter payments made to the buyers. According to the Independent McCormick claims that he only got £12 million out of the $75 million paid out by the Iraqi government. He may be lying about the size of his cut, just one invoice was for $38 million, but there is little doubt that massive amounts were paid out in bribes. Even so, sad to say Dr. Pornthip Rojanasun Thailand’s premier pathologist and crime scenes investigator was also taken in by the GT200 and supervised its use to detect bombs and bomb making equipment in insurgency struck southern Thailand. In London Richard Whittam QC, prosecuting McCormick, said fantastic claims were made that the detectors could find substances from planes, under water, under ground and through walls. They claimed to be able to bypass “all known forms of concealment” and be able to detect at distance. Items could be detected up to 0.6 miles underground, up to 3 miles from the air and 100ft underwater, it was said. “The devices did not work and he knew they did not work. “He had them manufactured so that they could be sold – and despite the fact they did not work, people bought them for a handsome but unwarranted profit. “He made them knowing that they were going to be sold as something that it was claimed was simply fantastic. You may think those claims are incredible. Experts said the ADE 651 “lacks any grounding in science, nor does it work in accordance with the known laws of physics … completely ineffectual as a piece of detection equipment”. It was no better than trying to detect explosives at random, said Mr Whittam. The devices were sold by McCormick and his companies along with training and “sensor cards”, the court heard. Mr Whittam told the jury McCormick bought 300 Golfinder novelty machines for finding golf balls from the US between 2005 and 2006. The forerunner of the 101 model, the 100 “was actually a golf ball finder that could be purchased in the USA for less than 20 US dollars”. This is what we said – way back when and also this and this. That’s because of the wishy washy way the Thai English language press dealt with the issue at the time – but at least they showed they were not kidding the Thai people. Then Prime Minister Abhisit Vejjajiva’s hilarious explanation. At the time he was unsure of the GT200 machines which, like the ADE651, worked not on batteries but human static and that of course depended on the physical condition of the operator, ahem. If the operator was tired, well perhaps the bomb could not be detected. He said the Office of the Narcotics Control Board wanted to go with battery operated ones. You can make it up! Watch below. 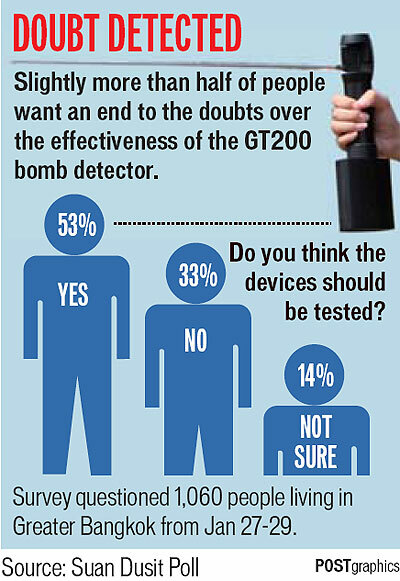 The GT200 is a fraudulent “remote substance detector” that is claimed by its manufacturer, UK-based Global Technical Ltd, to be able to detect from a distance various substances including explosives and drugs. 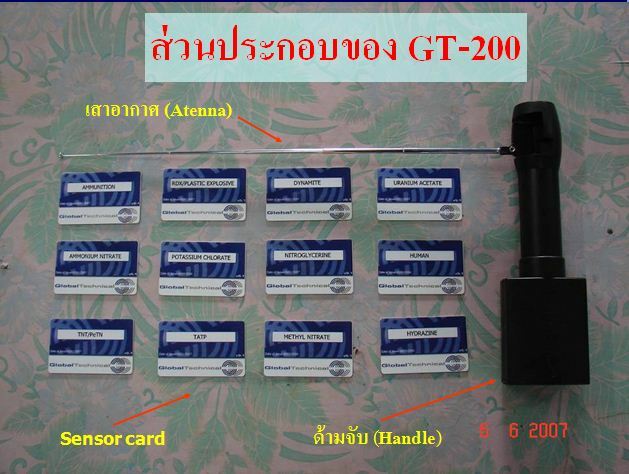 The GT200 and its many iterations (Sniffex, ADE651, HEDD1) have been sold to a number of countries for a cost of up to £22,000 ($36,000) per unit, but the devices have been criticised as little more than a “divining rod” which lack any scientific explanation for why it should work. The GT200 is used extensively in Thailand. Reportedly, some 818 GT200 units were procured by Thai public bodies since 2004. These include 535 bought by the Royal Thai Army for use combating the South Thailand insurgency and another 222 for use in other areas, 50 purchased by the Royal Thai Police for use in Police Region 4 (Khon Kaen), 6 bought by the Central Institute of Forensic Science, 6 by the Customs Department, 4 by the Royal Thai Air Force and 1 by Chai Nat police. Other agencies such as the Border Patrol Police Bureau and the Office of the Narcotics Control Board use a similar device, the Alpha 6, procured from another company. According to the Bangkok Post, the Royal Thai Air Force first procured the GT200 to detect explosives and drugs at airports, followed by the army in 2006. According to Lt Gen Daopong Rattansuwan, the Deputy Chief of Staff of the Royal Thai Army, each GT200 bought by the army cost 900,000 baht (£17,000/$27,000), rising to 1.2 million baht (£22,000/$36,000) if 21 “sensor cards” were included with it. In total, Thailand’s government and security forces have spent between 800–900 million baht ($21 million) on the devices. 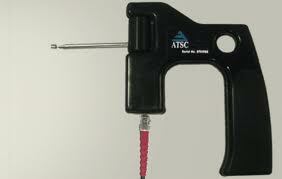 The ADE 651 is a fake bomb detector produced by ATSC (UK), which claimed the device could detect from a distance the presence and location of various types of explosives, drugs, and other substances. The device has been sold to a number of countries in the Middle and Far East, including Iraq, for as much as $60,000 per unit. The Iraqi government is said to have spent £52m ($85m) on the devices.Investigations by the BBC and other organisations found that the device is little more than a “glorified dowsing rod” with no ability to perform its claimed functions. 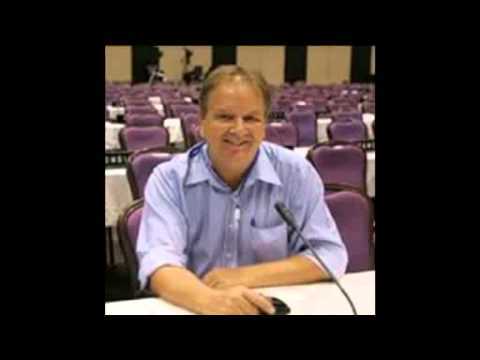 In January 2010, export of the device to Iraq and Afghanistan was banned by the British Government and the managing director of ATSC was arrested on suspicion of fraud, and in June 2010 several other companies were raided by British police. ATSC was dissolved on 5 March 2013. 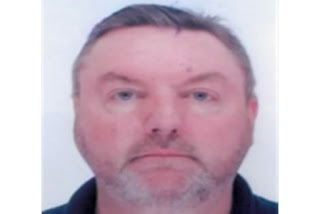 On 23 April 2013, the businessman behind the device, James McCormick, was convicted of three counts of fraud at the Old Bailey in London. The use of the device by Iraqi and Pakistani security forces has become a major international controversy. The virtually identical GT200and Alpha 6 devices, which are widely used in Thailand, have also come under scrutiny in the wake of the revelations about the ADE 651.